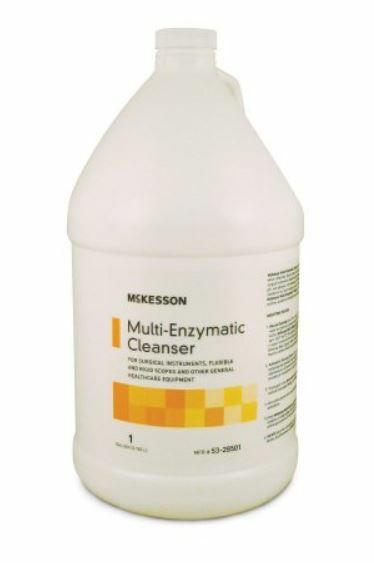 McKesson Multi-Enzymatic liquid cleaner comes in a 1 gallon jug and has a eucalyptus spearmint scent. 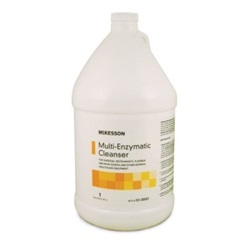 Contains a synergistic combination of multiple enzymes, which effectively cleans away blood, proteins, fat, carbohydrates, and synthetic liquids from surgical instruments, flexible and rigid scopes, and other general healthcare equipment. Its neutral pH, non-abrasive, non-foaming, 100% biodegradable formula is easy to use, and is specifically created to not harm metal, plastic, rubber, corrugated tubing on the equipment being cleaned. Effective in both manual and automated reprocessing systems, as well as ultrasonic units and washer sterilizer/decontaminators. Manufactured by McKesson.